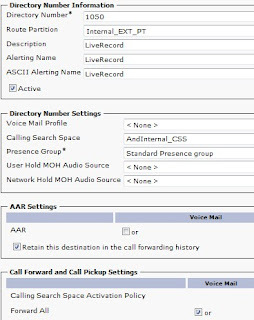 One of our users recently asked if she could record with our Cisco phone system. I didn't have anything setup for that, but it is quite easy to accommodate. The feature is called Live Record and it is built into my Unity Connection software. 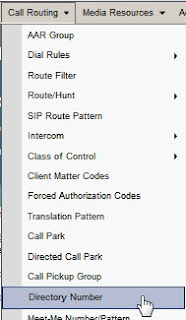 I am currently running Cisco Unified Communications Manager 8.6.2 and Cisco Unity Connection 8.6.2. You will need a directory number pointing to your Live Record service. In order to do that you will need to pick a number and have it forward to voicemail. 3. Pick an unused directory number. NOTE: I use a range specifically for services like these on my system. 4. Make sure you select "Active". 5. 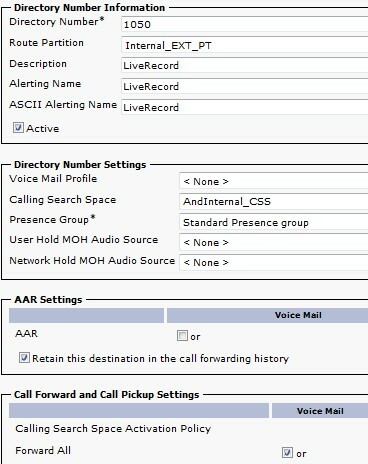 Under the "Send Call to" section select the "Conversation" radio button and choose "Start Live Record" in the drop down box. 6. 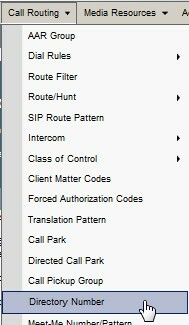 Under the "Routing Rule Conditions" section click "Add New". Select the "Dialed Number" radio button. That's all there is to it. 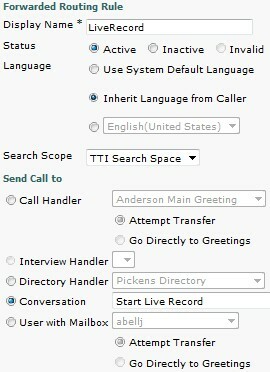 Test your work by dialing the Live Record directory number. You can also conference in Live Record with another caller to record a conversation. When you are finished recording you can remove Live Record from the conference or simply hang up. The person who dialed the Live Record number will receive a .WAV file recording of the conversation in their email. The next thing you will run into is the maximum recording length. By default it is 300 seconds or 5 minutes. If you want to increase this time limit you will have to edit the "Class of Service" that the caller belongs to. When you change this it will change the value for all users that are a part of this Class of Service. For some shops it simply won't matter, but for larger shops you may want to create a duplicate class of service as your standard and allow longer messages. Then assign your users that need Live Record to the new Class of Service. NOTE: When the maximum message length is changed it is effective for ALL recordings, NOT just Live Record messages. 1. Go to "Class of Service", "Class of Service"
2. Click the class you want to edit. 3. Change the "Message Length" to the desired limit measured in seconds. NOTE: The default is 300 seconds (5 minutes) and the maximum is 3600 seconds (20 Minutes). The next question you will get from the users is about the beep that plays during recording. This beep will not be heard on the recording, but it is there to let both parties know they are being recorded. There are legal issues at play here. I am not a lawyer, but I believe your state laws will need to be researched before you make changes or disable the recording beeps. 1. Go to "Advanced" and "Telephony"
2. Find the line that says "Live Record Beep Interval in Milliseconds"
NOTE: If the setting is blank the default will be 15000 milliseconds. To disable the beep you can set it to 0. Otherwise the beep interval will be whatever you set it to. 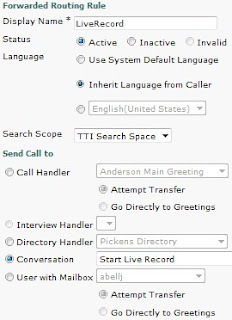 IF you decide to disable the beep you will probably need to make a policy that requires an employee to read a "This call is being recorded" script after conferencing the Live Record service in. That way the recording itself will contain the recording notification to the caller..